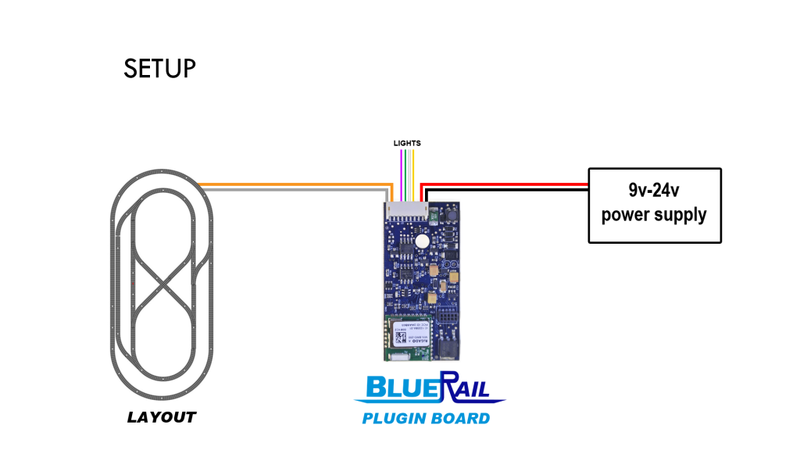 Kevin Stevens of Oklahoma uses a BlueRail board to power a standard DC train layout and remote operate trains with an iPad. The idea is to use the to leads from the board that would typically run to the motor (orange and grey wires in diagram below) and use those to power your track on a conventional DC layout. This also leaves 4 accessory leads available for light or accessories (which can also be controlled from your smart device). Kevin houses the board in a protective box and hooked it up to a 19 volt power supply. He brought his control box to the N scale layout of Dave Salamon in Owasso, OK to try it out. Dave’s layout is called the “Deep River Southern” and is a DC powered N scale walk around layout with an Armstrong type elevator. You can read more about the “Deep River Southern” here.